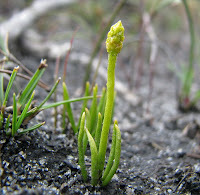 The Pigmy Clubmoss is the only recognised species in the Phylloglossum genus and currently listed in the Lycopodiaceae family, although some authorities now place it into Huperziaceae. 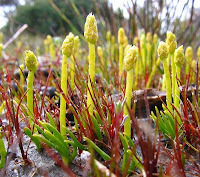 Clubmosses are more commonly known from the larger Lycopodium genus, but none of these are known to exist in Western Australia. 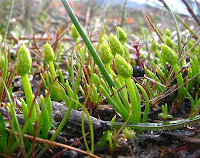 The genera differ by the Lypodods having small leaves along the stems and Phylloglossum only a basal rosette. 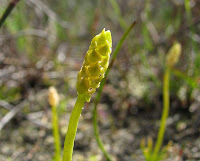 Clubmosses are not flowering plants, but related to ferns by producing asexual spores and are generally known as Fern Allies; their clubs are the cone-like structure at the apex of the stem where the spores are produced. The Pigmy Clubmoss occurs across southern Australia including Tasmania and extends to the northern island of NZ. 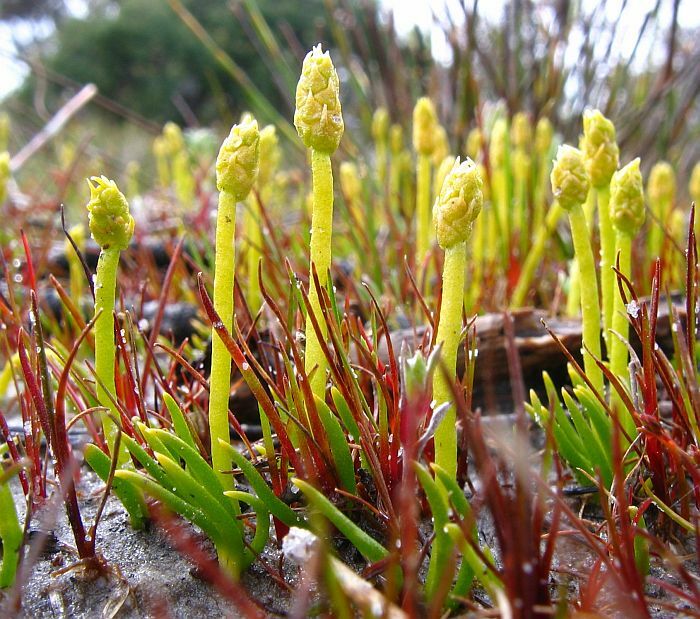 It is rarely collected and probably remains unnoticed as colonies are ephemeral, small and well separated, plus the plants themselves are slight, being only 3 to 5 cm (1”- 2”) in height, therefore you need to be carefully looking in the right place at the right time. 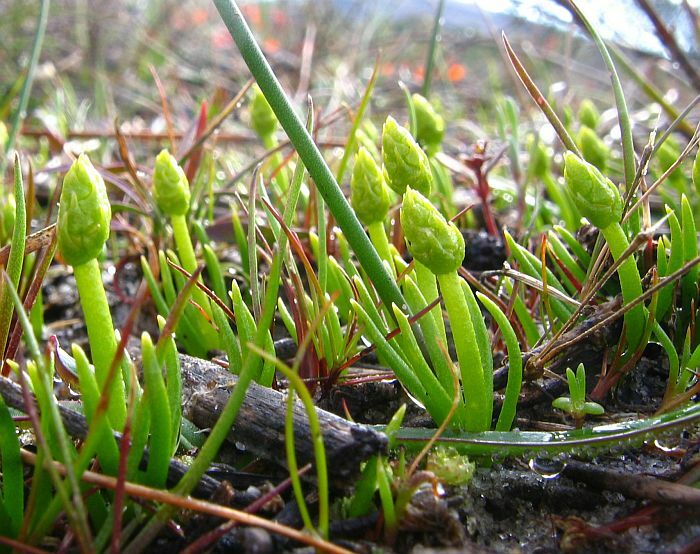 In WA the Pigmy Clubmoss has been extensively collected from near coastal locations north of Perth to Albany with a few collections east of Esperance, where mainly encountered in low-lying peat/sand soils around light seepage areas, swamps, flood zones and over granite. 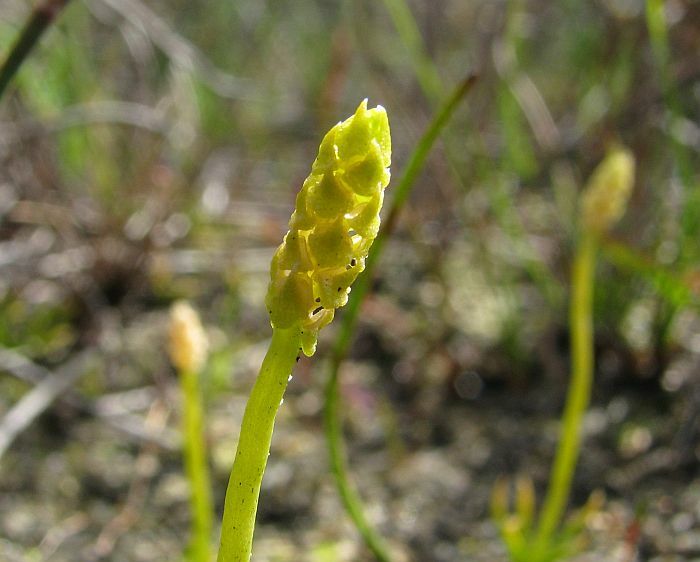 The colonies are usually contained within a square metre/yard, although they can number well over a hundred and although collectively common, their small compact colonies make them vulnerable to habitat destruction. They normally make their appearance between July and October.